The Pablo Center at the Confluence will finally open Sept. 22, after six years of effort. And in that time, our community has found itself newly inspired – and on the brink of becoming a genuine destination. Over the last six years, as a community we’ve all followed the twists and turns of the Confluence Project. In the years since it was first announced in 2012, we saw the advocacy, the opposition, the debate, the vote, the donations, the state funding, and eventually, the construction (see our old primer on the project). And that’s oversimplifying it. In 2016, downtown Eau Claire first witnessed the opening of the Haymarket Landing building, then the early construction of the beautiful arts center (video). Very soon, we will see the completion of the ambitious public plaza and connecting footbridge. But most notably, after countless gifts of time and treasure from thousands of locals and businesses, the public will see the beating heart of it all on Sept. 22, when the doors to the Pablo Center at the Confluence finally open. Needless to say, the road has been long. So long in fact it’s been easy to lose sight of how far our downtown has come in the six years since the project was announced. So many businesses opened, apartments built, projects completed, events and ideas launched – all examples of a push toward a brighter future, and some inspired by the Confluence Project itself. The Jamf office. Two upscale hotels. Local retailers. A parking ramp. The High Bridge. Several restaurants and food trucks. Breweries. Music festivals. Art installations. And so much more. Not to mention an onslaught of media coverage about Eau Claire from publications like Time, Thrillist, Reader’s Digest, Midwest Living, and others. We are a growing city on the move, and things don’t seem to be slowing down. 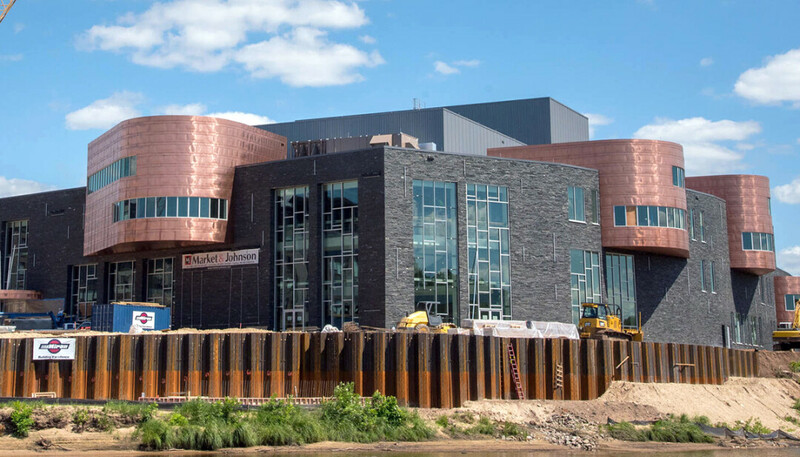 In fact, this summer the progress has intensified as the core of downtown Eau Claire – the confluence of our two rivers – continues a dramatic transformation. The rail bridge in Phoenix Park saw its first full season of colorful lights illuminating the stately structure each evening. Just down the Chippewa River, last month the newly overhauled Grand Avenue pedestrian bridge opened and nearly 200 people enjoyed a dinner event on its lengthy span. Soon after the Pablo opens this fall, Visit Eau Claire will open a downtown Visitors Center in that same facility, welcoming travelers and locals to experience this new Eau Claire. Yet this fall, the new Haymarket Plaza outside the Pablo will be completed, and the new pedestrian bridge spanning the Eau Claire River will open to foot traffic for the first time. And finally, adding to the dramatic lighting on the existing rail bridge, soon a whole district of lights will come to life, as the refurbished Grand Avenue bridge, the new Phoenix Park-to-Haymarket Plaza arched bridge, the Haymarket Plaza and retaining wall, and the Pablo Center itself will be illuminated by colorful, programmable evening lighting. And all this within a less-than one-eighth-mile circle. Imagine how different it is now to spend a weekend downtown as a visitor compared to 10 or 15 years ago. You can stay in nice hotels, enjoy a huge range of fantastic dining options, shop at a variety of interesting retailers, attend tons of events, and explore coffee shops, parks, trails, music venues, the farmers market. ... Take that growing public and private infrastructure, and now layer in an incredible center of gravity to it all through an active and breathtaking arts center, a well-designed plaza, and a trio of beautifully lit footbridges – well, you’re starting to have the makings of a genuine destination. But for a moment let’s acknowledge that the dream isn’t perfect. We’ve still got a ways to go, even at the Confluence. The budget for the arts center swelled and fundraising isn’t quite complete. Several retail spaces inside the Haymarket Landing building are still vacant. And what was hoped to be a plaza-side/riverside restaurant will – at least for now – become a controversial Foxconn office space instead. While their reported 150 jobs across two downtown buildings would be very welcome additions to the economy, I’m typically not in favor of any prime, main-level downtown retail frontage going toward office space, regardless of the company. This and other growing pains are to be expected, and they’re nothing we can’t manage going forward. If a path isn’t difficult, it’s probably not worth taking. So it is indeed a good time to be in Eau Claire. All this progress and excitement considered, if you’re anything like me you want to be at the Pablo on Sept. 22 for their grand opening, including an afternoon celebration/open house and evening debut show, “Cabinet of Curiosities.” Because this moment – while significant and historic in its own right – is about more than the Pablo itself. It’s a culmination of many years of vision and effort from countless leaders, doers, and supporters across this city, all pushing in varied ways toward what they know this community can become. The Pablo is just the latest and greatest monument to that effort, and a crown jewel in the new landscape we’re all shaping together. So as the doors of the theater open to the public for the very first time, I’d just like to say to the entire community – break a leg! I’ll see you there.